Background:Cardiovascular diseases (CVDs) are the most common cause of non-communicable disease mortality in sub-Saharan African (SSA) countries. Evidence on the awareness and knowledge level of cardiovascular diseases (and associated risk factors) among populations of sub-Saharan Africa is scarce. Objectives:This review aimed to synthesise available evidence of the level of knowledge of CVDs in SSA. Methods: Five databases were searched for publications up to December 2016. The quality of the quantitative and quantitative studies was assessed based on National Institute of Health (NIH) Quality Assessment Tool for Observational Cohort and Cross-Sectional Studies and the Critical Appraisal Skill Programme (CASP) tool, respectively. 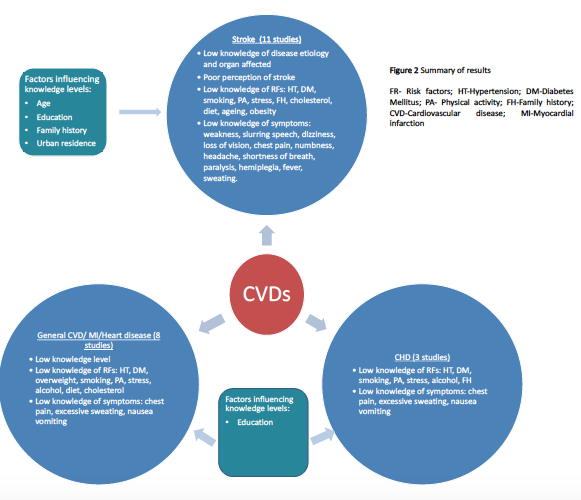 Narrative synthesis was conducted for knowledge level of CVDs, knowledge of risk factors and clinical signs, factors influencing knowledge of CVDs and source of health information on CVDs. The review was registered with Prospero (CRD42016049165). Results: Twenty studies were included in this review: 18 quantitative and 2 qualitative, Figure 1. This review identified low knowledge level, poor perception of CVDs, and knowledge gaps for risk factors and clinical symptoms of CVDs. In most studies, less than half of the subjects had good knowledge of CVDs. The percentage of participants unable to identify a single risk factor and symptom of CVDs ranged from 1.8% to 56%, and 9% to 77.3%, respectively. Educational level and type of residence influenced knowledge level of CVDs among SSA populations, Figure 2. Conclusions: Knowledge level of CVDs, risk factors and warning signs for CVD are low among sub-Saharan African populations, and this is linked to low educational attainment and rural residency. The findings of this study prompt educational campaigns to enhance knowledge of CVDs in both rural and urban communities.